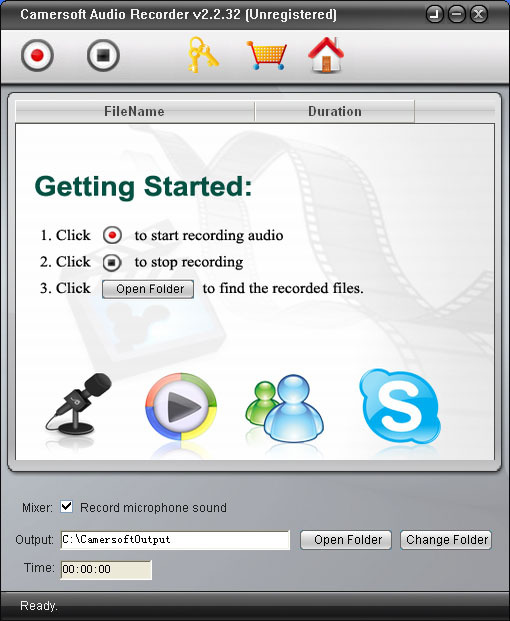 Camersoft Audio Recorder is powerful and professional recording software, which could record any voice and sound of PC into MP3 files, including the audio from microphone, the music player, video player, IM tools like MSN, Skype and other software. With new sound recording technology, this audio recorder could record sound with best quality, so you could use it as music recorder. Actually, Camersoft Audio Recorder could capture all voice. (4) Free download to try and free to upgrade once puchase. Where are my recordings located? The default Path is C:\CamersoftOutput.But you can click "Change Folder" button when or before recording, and click "Select a location "on your computer for the output audio files. Qweas is providing links to Camersoft Audio Recorder 3.1.36 as a courtesy, and makes no representations regarding Camersoft Audio Recorder or any other applications or any information related thereto. Any questions, complaints or claims regarding this application Camersoft Audio Recorder 3.1.36 must be directed to the appropriate software vendor. You may click the publisher link of Camersoft Audio Recorder on the top of this page to get more details about the vendor.